Mangaluru, Feb 06, 2017 : The Lokayukta institution will hold public meetings to hear and receive complaints of delays in government service as well to ensure transparency in its dispensation, P Vishwanath Shetty, Lokayukta said. Transparency in government service is paramount and complaints abound about lack of speed in delivery of the same. Bureaucracy must understand that they are in place to ensure that the masses get benefits of various government schemes, he noted. Chairing a meeting of district level officials on Monday, Justice Vishwanath said it will therefore be his endeavor to bring greater transparency in the manner in which government machinery functions. 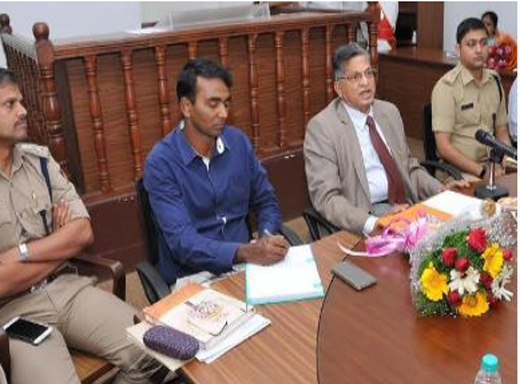 Personnel of Lokayukta police have been directed to extensively tour their jurisdiction and listen to public grievances. They in tandem with Anti-Corruption Bureau personnel have been instructed to visit government offices and ensure benefits of schemes reach the people. If government schemes are duly implemented, it will bring down pressure on both Lokayukta police as well as the ACB, he said. Government hospitals, schools, department of women and child welfare, anganwadis, student hostels are key institutions that reach out to the masses and the poor. There can be no excuse for deficiency in discharge of functions by these institutions and other key departments, he said, adding the Institution will keep an eye out on their functioning. There will be checks on quality of food supplied in government hostels. Government must take steps to fill vacancies of doctors in government hospitals on priority. Officials of urban local bodies must ensure that multistoried buildings in city have own sewage treatment plant and have taken steps to ensure that rain water harvesting systems are in place, he said. District officials briefed the Lokayukta about progress of various schemes implemented by their department.